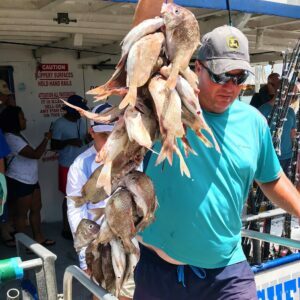 Inshore– We are still red tide free inside John’s Pass and along the beaches of our area, however, it is hanging out in spotty locations off our coast but doesn’t seem to be affecting our fishing. We are still seeing lots of triple tail around the dock lights of Johns Pass eating on live shrimp. The triple tail action is mostly at night. Robert Bogacki from Gulfport, who is the fishing manager at the Tampa bass pro shops has been tearing up the triple tail around Johns pass along with a few nice trout too. 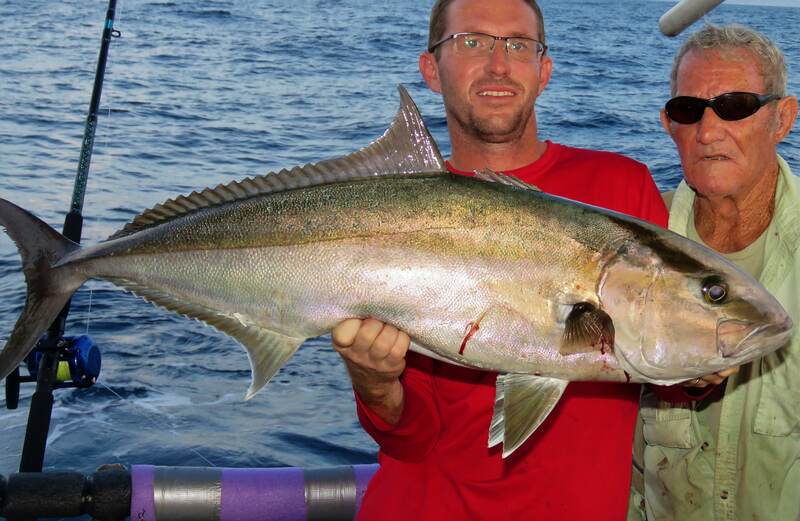 We are still seeing plenty of snook around Johns Pass too. Capt Frank Bacheler, our half day and all-day party boat captain, got a few nice big snook this past week using a large piece of dead bait weighted to bottom right around the docks of John’s Pass. They seem to be extra lazy lately with the warmer waters. We are seeing the mangrove snapper action continue throughout the pass along the structure. Plus, the structure of Johns Pass is starting to hold the higher numbers of Sheepshead too as the water cools those sheepshead will become more and more prolific and larger and larger in size. The fall and winter are a great time for sheepshead fishing around our area. We love to use 15-20lb fluorocarbon leaders with 2ot hooks and super light weight or none at all with a barnacle, piece of shrimp or a fiddler crab for bait to target these great eating, hard fighting and fun to catch sheepshead around Johns Pass Madeira beach. Near shore– The red tide fish kill is hanging off our coast 2-3 miles from shore and extending out to 8-10 miles from shore so this 5-8 mile stretch reaches from Egmont key channel up to nearly clearwater pass area, but it gets thicker south of Johns Pass and thinner up north of us. We are still catching plenty of great fish beyond this area and were catch plenty of mackerel and bait fish inside of this area. Plus, were able to get our live baits through it in our live wells without killing the bait so it seems very spotty and not too concentrated. Also, when you drive through it you can see clean water behind the boat telling us it’s not too deep in the water column. We are hoping this clears up quickly but for now were just bouncing around outside this ‘line’ of dirty water and fish kill and doing well! The hogfish bite is fairly steady when you can find em chewing, some days they are while other days its slow on the hogs. However, as the water cools there’s going to be more and more days where they are chewing well for us. The triple tail are also thick near shore as well, we even caught one this past week of a dead fish as we traversed the fish kill zone along our coast. The mackerel are still thick near shore as well outside the dirty water and right along its edges chasing big bait balls around the near shore waters. The kingfish haven’t made their way near shore quite yet, but we are seeing more and more offshore. 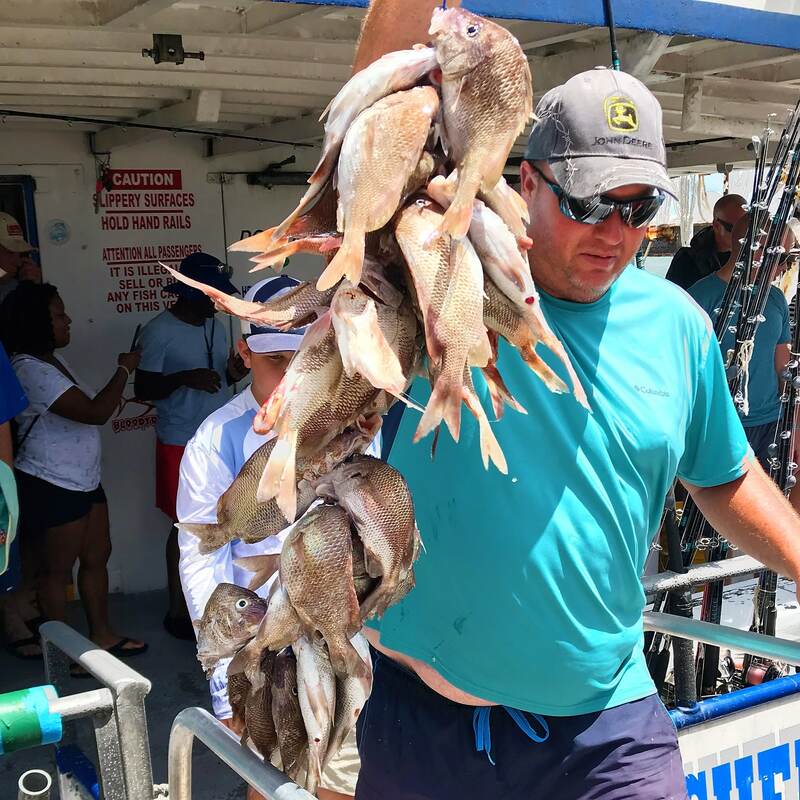 Offshore – This past weekend’s 39 hour trip did well, but they had to fight an extremely strong current and somewhat bumpy conditions to grind out a decent catch. It was a knock down drag out fill the boxes trip but after a long stretch of sticking and moving Capt Garett was finding them enough fish to have a good time. It’s not that we weren’t on the fish, it was just tough getting baits down and feeling the bite when the current was running well over a knot, and the three to four foot seas added even more difficulty in feeling the bite for the anglers on board. However, we got some nice big amberjack, nice pile of good eating mangrove snapper, some yellowtail, porgies, vermillion, red grouper, gag grouper and even some kingfish while trolling to make it an all around good trip. 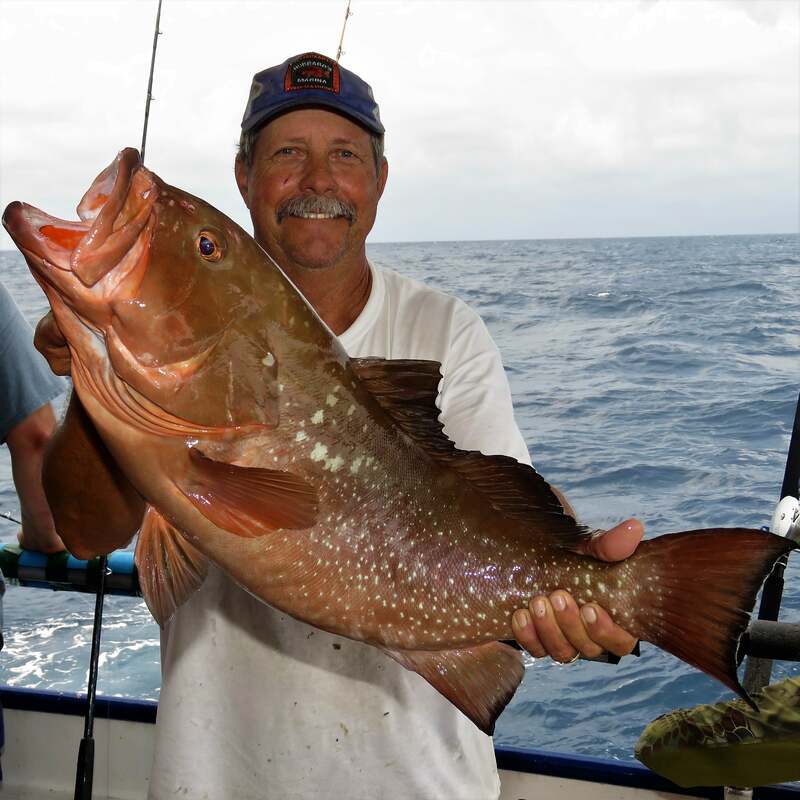 The 12 hour extreme trips aboard the Flying HUB 2 and it’s long range fishing charters have been doing very well out there on big amberjack, red grouper and gag grouper too! The 12 hour extreme trip has super light loads over the next month and it’s a great option to fish the 39 hour area in a single day trip! Red tide is not in the pass or along the beaches of our area, however, we do have a stretch of it off the coast. Again, this isn’t a super thick choking kill everything red tide. It’s only very light or mild right now with very sporadic small amounts of dead fish around tidal rips where the wind and currents accumulate the dead small bait fish that are super susceptible to even the lightest red tide presence. So this is not affecting our cruises or back bay dolphin tours, or even the sunset cruise isn’t really seeing any fish or effect from the red tide. Two Tortillas with shredded cabbage, pico de gallo, cheddar cheese, chipotle mayo and sour cream. Sunday-Thursday 11:00 A.M. – 9 P.M.